Depicts the interrelationship between wheat sourcing, wheat gristing, flour correction and major business deliverables or expected outcomes from a mill. Together, these factors and outcomes can help optimize costs, standardize flour performance and support new product development. Because of their performance predictability, baking enzymes are also an attractive option during gristing consideration at the flour mill. Immature and Frost Damaged Kernels These kernels are usually found in Manitoba wheat No. 5. This normally ground for disqualification . they are a cause of poor flour yield and dark flour color, but they promote gas production in the dough in yeast fermentation. Frost damaged kernels are usually blistered on the outside. Sprout-Damaged Kernels These are wheat kernels that have begun to sprout or germinate in the wheat ear out in the field as a result of continuous high moisture. These kernels are similar to malting-barley kernels. The internal break-down has already begun, thanks to the activity of strong enzymes. Dough made from sprouted wheat flour are sticky, due to excessive amounts of alpha-amylase. 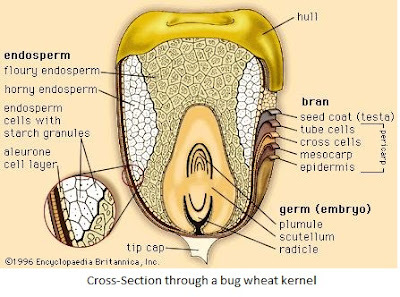 Picture above give an idea of the structure of a wheat kernel and its various constituents, as well as its % mineral matter (ash content on dry matter basis). 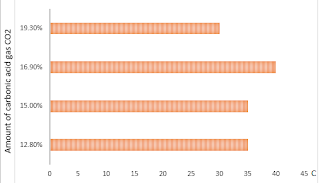 The amount of each constituent in the whole kernel is also given in percent. The flour cells (endosperm) are mainly filled with starch and protein, and represent a dry reserve for the germ. The sprouting germ derives its first nourishment from this part. 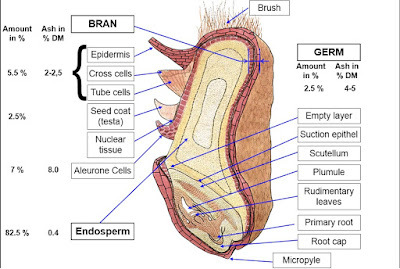 The thickness of the whole bran varies with the varying thickness (0.048 – 0.066 mm) of the longitudinal cells (pericarp). The colorless aleurone cells do not cover the germ. The ash content of these cells is more than 20 times higher than that of the white flour (endosperm). This layer is approx. 0.05 mm. thick and contains up to 30% protein (but no gluten protein), lipids (another 30%), vitamins and enzymes. A toxic substance has been found in the aleurone fat of the rye kernel which is of importance in animal feeding. 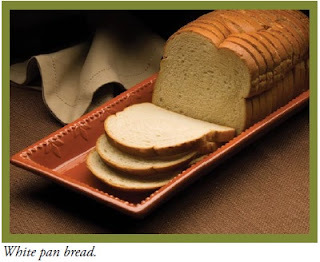 1.Purity of the wheat, i.e. dockage or Besatz and other impurities The lesser the admixture, the higher the value of the wheat. Mechanically operated apparatuses (e.g. Granotest) have been developed in recent years to ascertain the percentage of impurities. The evaluation is done by a standard method. 2.Test weight (bushel or hectoliter weight) The viewpoints differ greatly as to the significance of these factors to milling. It is in any case an accepted fact that these factors are not always indicitive as to the milling quality of wheat.